You’ve decided to look into a long-range scope for your firearm. Whether it’s for hunting, competition, or you’re just a gun enthusiast, you want to make sure that you’re going to get a quality sight. There are plenty of long-range sights on the market. There’s the basic fixed-power scope with no unnecessary features on one end of the spectrum, and then there’s also the 8-80x56mm scope with an illuminated reticle, adjustment turrets, and all the bells and whistles you can think of, as well as everything in between. This doesn’t mean that one scope is necessarily better than another though, all of those features have their purposes. Which one you should pick solely depends on the situation and your reasons for getting the scope in the first place. So before we get into whether or not a specific scope is better for your current situation we should go over some of the basics. That way you can better understand what the differences between various sights are. Arguably the most important part of the scope itself, the lenses are the pieces of glass that magnify the scope's image in the first place. A great lens is essential when picking a scope, if your scope has lenses that don't produce quality images, it'll make it that much harder to line up your shots. You also want to make sure that the lenses of your scope are resistant to things like fog, water, and physical trauma, especially if you’re using it for hunting. Though that’s not a huge deal as it’s industry standard at this point. There are tons of different reticles out there, illuminated, duplex, mil-dot. Picking a scope with a good reticle will make your life that much easier. Many reticles come with various ways to gauge bullet trajectory and make it a breeze to land your shots even at long ranges. Let’s take the example I gave before, an 8-80x56mm scope, to explain what all the numbers mean in the first place. When talking about a scope’s specifications, the first range of numbers, 8-80, is referring to the scope’s magnification (or power). This means that while at it’s the lowest power, the scope would magnify the image by 8 times, and at highest, it would magnify it by 80. Generally the higher a scope’s power, the more expensive it’s going to be. Keep in mind that more power is not always better. When you have your scope at its highest setting, your field of view decreases drastically at short ranges, this makes it nearly impossible to line a shot up effectively. Which is why it’s important you get a sight with a power setting that matches your needs. The second number, 56mm, refers to the size of the objective lens, or the lens that will be closer to your target when shooting. The larger the objective lens, the more light that’s let into the scope, so if you plan on doing a lot of shooting in low-light conditions, consider a scope with a larger objective lens. A standard size for objective lenses is 40mm. Those are just a few of the things that are important to consider when buying a scope. There are plenty of others that can be just as crucial to consider depending on your situation. For instance, if you know you’ll be shooting a firearm with a very strong kick, you may want a scope that lets your face sit farther away so it doesn’t kick back and hit you, the optimal distance that your eye sits away from a particular scope is called the eye relief. So make sure you know exactly what you need before making your final decision. With that being said, we’ve put together a list of some of the best scopes on the market as of now. Starting with the most expensive of the choices, the Burris XTR II. This is a scope designed with long-range shooting in mind. Its clarity is amazing, even at longer ranges the image still looks great. The scope is of great quality, its power goes from 8x all the way to 40x, its light gathering capabilities are good as well, making it ideal for low-light situations. And to help even further with visibility, the sight comes with an F-class illuminated reticle too. The scope comes with a limited lifetime warranty so should anything go wrong you’ll be able to get a replacement in most cases. If you really need a scope that provides near-perfect clarity even at long ranges, then this scope is well worth the price point. The Trijicon TR23 Accupoint is another scope that’s quite high in terms of price, but that’s not to say it isn’t still a great value. The TR23 makes it easy to shoot in any conditions with its battery-free illuminated reticle. The scope itself has magnification ranging from 5x to 20x, and its objective lens measures 50mm. It also has room for 40 MOA of adjustment, so you shouldn’t have any trouble adjusting your sights. It comes with three different choices for reticles, from the more standard duplex and mil-dot reticles to their BAC triangle post. Honestly, the reticle type is up to personal preference as they’re all pretty good. All the reticles also have fiber optic and tritium illumination, which means you can still have an easy time in suboptimal lighting conditions without having to worry about a battery. The structure is extremely sturdy and is able to withstand most weather conditions. Which means you can use the scope without much worry of damage even with rough use. And if something does happen to the scope, there’s a lifetime warranty for anything relating to the structure or optics, though the illumination itself only has a warranty of 15 years. This scope is an overall great choice for someone looking for a high quality, high clarity scope. With great features like its batteryless reticle and its solid construction, it’s definitely a good value for the price. The Vortex Optics Strike Eagle is one of the lower power scopes on this list. Its maximum magnification is 6x. This doesn’t mean it’s not useful however, it’s great for mid-range shooting, and there are options for higher powered scopes in the same series as well, with the highest being a 4-24x scope. The objective lenses are for the scopes are anywhere from 24mm for the lower powered variants, to 50mm for the highest. The scope is very sturdy, it's waterproof, shockproof and fog proof and the lenses are multicoated, providing an excellent quality image even at range and in the dark. There's also battery storage under one of the adjustment turrets. They all have illuminated BDC (Bullet-Drop Compensation)reticles that make it a breeze to focus in and line up your target. Though at maximum power the scope does lose a bit of focus. The warranty lasts a lifetime too should your scope ever be damaged. Overall it’s a very strong contender here, with a mix of (relative) affordability while still staying high-quality. This scope won’t disappoint. A scope meant for .308 rifles, it offers up to 14x magnification and has plenty of features to make your shooting easier. The magnification goes from 4x to 14x, and the objective lens is 44mm and the glass is extremely clear even at long ranges. The illuminated reticle is designed for .308 ammunition and has marks to help with factoring wind, leading your target, and bullet trajectory. It has 6 brightness settings and once you learn how to use it calculating your shots will be child’s play. It’s got a very durable build, being waterproof and shockproof, so you shouldn’t have to worry about handling it harshly too much. The scope will also hold it’s zero quite well even after extensive use. If the scope does ever get damaged it comes with a limited lifetime warranty so you should be able to get it replaced in most cases. The VX-1 is for those who enjoy no-nonsense, simple scopes. It has a magnification range from 3x to 9x and the objective lens is 40mm. While the reticle itself isn’t illuminated, the scope still works well in low-light conditions due to its 4 lens system. 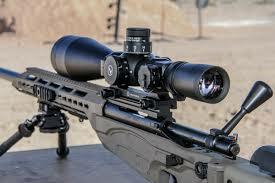 The glass is extremely clear and you should have no problem making out details with the scope. It uses 4 lenses to not only provide great clarity but also make it great at gathering light, so you can still see in low-light situations. The sight was not intended for anything within close range, so it’s not as versatile as some others, but if you are only interested in long-range shooting this shouldn’t be a problem. The reticle is a simple duplex for those who prefer scopes that aren’t insanely busy. Though the scope supports custom reticles as well. The scope is waterproof and fog proof, and Leupold offers a lifetime warranty for it as well. For those who don’t need or want all the fancy features that some of the more expensive scopes may have, this is a very good choice, especially considering its price tag of only $239.99. Though if you intend to do short range shooting then you might want to look elsewhere. The Nikon Buckmasters II is a great value. Costing under $200, but outperforming many of its higher-cost alternatives by quite a margin in some cases. The scope has multi-coated lenses that ensure a high contrast, high quality, high brightness image in various conditions. Another unique aspect is Nikon’s Spot On App. Which allows you to do all of your calculations with your phone. The scope itself has a magnification range of 4x-12x and the objective lens is 40mm. The lenses are crystal clear and their multi-coating means you shouldn’t have a hard time seeing even in some of the lowest visibility conditions. The scope has a BDC reticle that should make lining your shots much easier. The Buckmasters II should be able to withstand some harsh treatment as it’s water, shock and fog proof. And if that weren’t enough assurance, Nikon offers a lifetime warranty for it as well. Overall the Buckmasters II is a scope with great value and even outshines many of the more expensive scopes on the market. The first of the scopes coming in under $100 is the UTG BugBuster. The BugBuster is a compact and lightweight scope, and despite its low price, it performs very well. The scopes magnification range is 3x-9x and it has an objective lens of 32mm, though the objective lens is adjustable. The optics are some of the clearest you'll get at this price point. If you want anything that compares in clarity you'll be paying quite a bit more in most cases. The only issue with the sight itself is that the eye relief is quite small, which may make shooting with it slightly uncomfortable for some. The reticle is an illuminated mil-dot setup, and the scope has a color adjuster, letting you customize the reticle with RGB colors. The build quality is also super tough, so the scope should be able to survive almost anything you’ll put it through during regular use. And it comes with a lifetime warranty just in case anything does happen to damage it. The Bushnell Banner Dusk & Dawn, or Bushnell D&D for short, is another good choice for those on a budget, costing only under $200, it’s a steal. The power range is from 3 to 9x and the objective lens is 40mm in diameter. The lenses themselves have dusk and dawn brightness coatings, (or DDB), which help more light get into the scope. Providing a much clearer image even in low brightness locations. The Reticle is just a simple duplex style, which definitely gets the job done, even if it doesn’t have all the bells and whistles that some others do. The scope is water, fog, and shockproof and the one-piece body only enhances its resilience. Though Bushnell includes a lifetime warranty with the scope too. For its price, the Bushnell D&D makes up its worth and then some. If you’re low on capital, or you just want a good sight without having to spend much then it’s a perfect choice. The Simmons 8-Point Scope is one of the cheapest options on this list, but don’t let that fool you. This scope is well worth its price point of a mere under $100. The power ranges from 3x to 9x and its objective lens is 50mm. The image quality, while not the best of the best, is very good considering the price point. With optics that provide a clear image, it's very easy to lock on to targets quickly and efficiently. The scope is waterproof, fog proof, and can stand up to the recoil of most firearms, though a spring rifle may be a bit much for it. If anything should happen to it, like with most of these scopes Simmons offers a limited lifetime warranty, so you can get it replaced with relative ease in most cases. Overall it’s a pretty good scope, and while it may not be the same level of quality as some of the more expensive scopes out there, The Simmons 8-point definitely delivers for its price. The Pinty AOEG is the cheapest option on the list by a fair amount, with a price of under $100. And despite the price, it actually has quite a few features that may surprise you. The scope itself has a magnification range from 2.5x to 10x and its objective lens is 40mm in diameter. The reticle is illuminated and has both green and red settings, with multiple brightness options too. For close range shooting the scope has a built-in laser sight too, which is a nice added benefit. The actual build quality of the scope is solid. While not the toughest, it is water and fog proof. The big downside with this scope is its warranty, which is only 6-months. Though considering its price and quality there isn’t much room for complaint. Overall it’s a solid scope and definitely worth a try if you’re looking for a quick, low-cost option. No matter which of these scopes you pick, they’re all great choices. It just depends on your current needs. Do you need something a bit cheaper or that ‘s versatile enough to be used in close quarters? Then the Pinty AOEG might be enough. Or maybe you’re looking for something a bit heftier, dedicated for long range, and you’re willing to spend a bit more on it, then go with the Burris XTR II. Remember, you don’t always need the highest power or the most expensive one to make your setup work. All the scopes here have their uses, so make sure you really think about your needs before making your choice. bobergarms.com is a participant in the Amazon Services LLC Associates Program, an affiliate advertising program designed to provide a means for sites to earn advertising fees by advertising and linking to Amazon.com. As an Amazon Associate we earn from qualifying purchases. Additionally, bobergarms.com participates in various other affiliate programs, and we sometimes get a commission through purchases made through our links. Amazon and the Amazon logo are trademarks of Amazon.com, Inc., or its affiliates. We do not specifically market to children under 13.